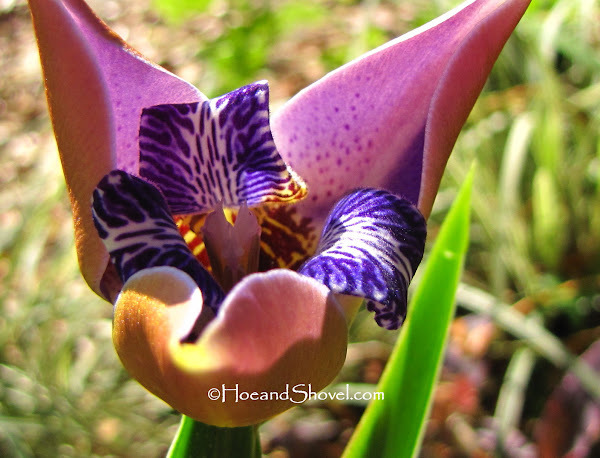 Louisiana Iris 'Sinfonietta' was one of my first attempts at bare root planting. Six of them were ordered via Internet in winter 2008. Three were placed in the back and three were placed in the perimeter of the edible garden. It was not known how well they would do in my garden. The bright green foliage is every bit of 3 feet tall and sails through our winters adding structure and vertical loveliness all year long. As early spring bloomers they are welcomed cheerfully emerging shortly after the winter months. Mine are located in partial sun but they will do well in full sun also. 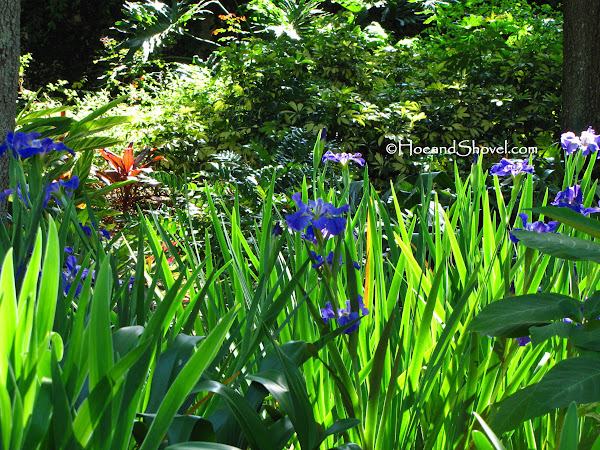 A very deep blue with flashes of green-yellow centers they have turned out to be a good choice for my garden. Bumbles travel around from petal to petal burrowing deeply for nectar. My one and only complaint is that the blooming period doesn't last long enough. From bud to finish the display of this non-bearded iris is only about a week... maybe two. Rhizomes are easily divided for transplanting and sharing. From those six original plants there are likely 50 planted in the gardens now. 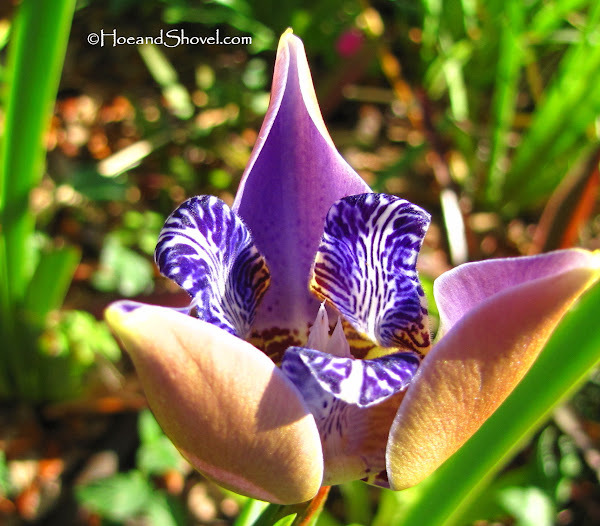 A supremely Florida-Friendly iris the Dietes iridioides 'African Iris' or 'Fortnight Lily' blooms in flushes from spring to fall. It is a cold hardy stalwart here being divided and utilized in almost every garden area to some extent. 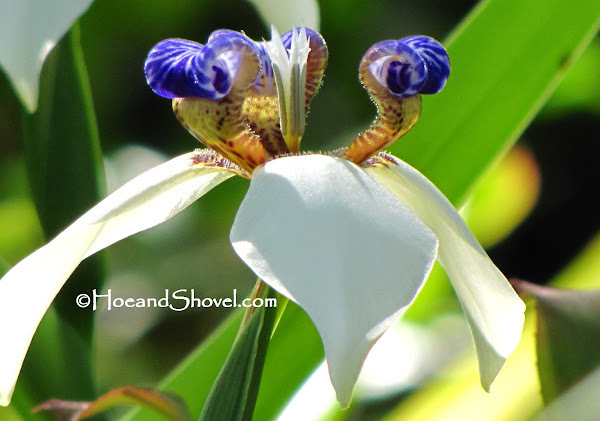 I've written extensively about this pure white, faithful iris many times on this blog. Indulge me please while I notice every single nuance of this favorite beauty. Don't recognize it yet? Every fine distinction of this flower is exquisite. Catching them as a new bud gradually opens each morning is a lesson in artistry. The final outcome of petals spread wide to the heavens somewhat disguises the multitude of hues this flower possesses. Tightly held morning buds of golden peach tones give no hint of the finite degrees of bluish-purple details about to be revealed. Thick, almost velvety petals come alive as the minutes pass. In this stage of opening the varied degrees and tinges of every color can be fully appreciated. Regina. 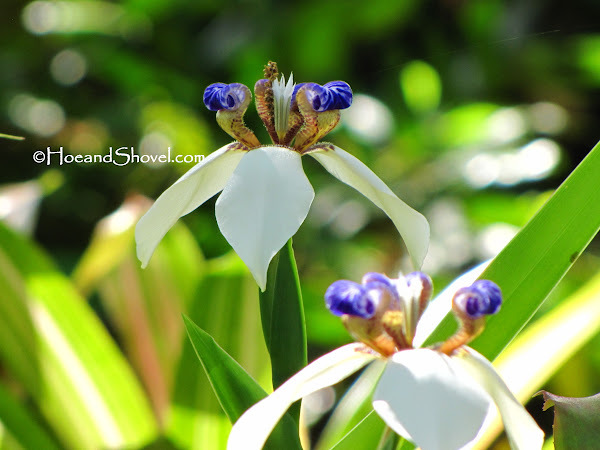 A regal name for a durable Florida plant that can take our heat and humidity. Neomarica Caerulea 'Regina' Apostle's Iris A close cousin to Regina, Neomarica Gracilis is borne on foliage much shorter and more chartreuse in color and purist-white petals are exchanged with Regina's purple beauties. She's a lovely specimen all on her own. She was passed along to me from a dear gardening friend. Which makes her cherished and admired. Forever hugs to you, KH. 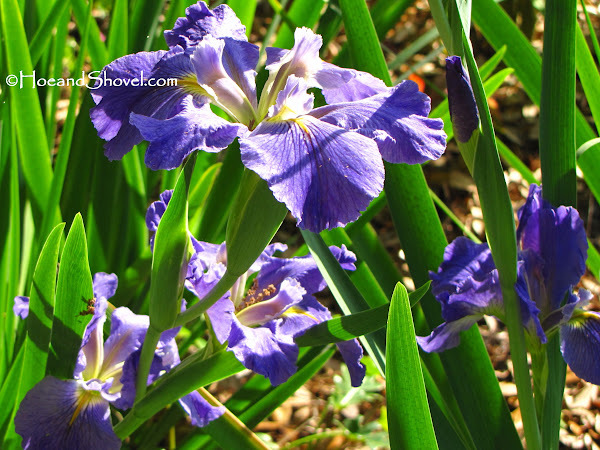 Both are walking irises and said to bloom from spring throughout summer. In my garden spring seems to be their best season. I'm going to watch closer for summer blooms but I think that might be a stretch in the available information. 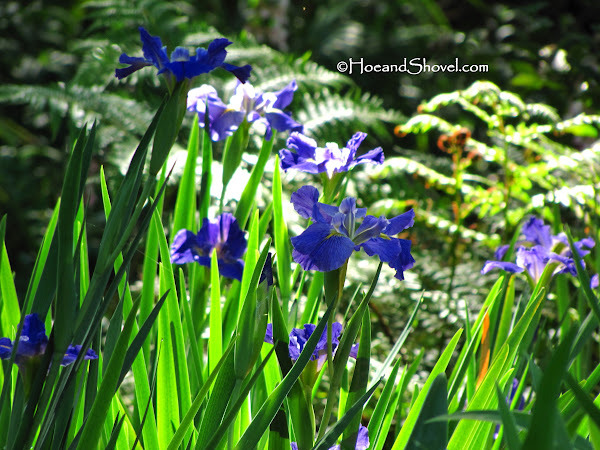 Irises are beloved by most gardeners. Which ones are you growing? Happy April to you Meems! I am growing more and more fond of iris. After you and Florida Girl posted pics of Regina, I had to have one. It is now happily living in my garden. You photography in today's post is amazing! This is truly the time of year the irises shine. Great photos of beautiful blooms. 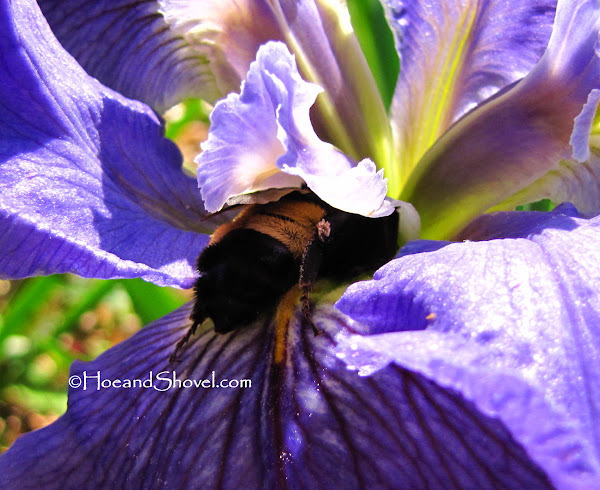 I love your Louisiana iris and can't believe how they have multiplied for you! Too bad those blooms don't last longer, but that just makes them all the more special. What beautiful photos, and those iris are all stunning. I have the walking yellow, and the African iris. I live down here in zone 10, so am not really sure how your other iris would do here. They have given me a serious case of 'I wants' though. Your gardens are such an inspiration to me. Your posts are full of wonderful info and gorgeous photography. 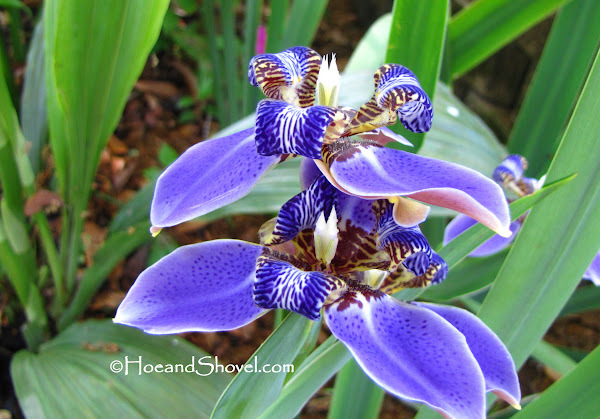 It is so nice to learn so much about gardening in FL. Thank you. 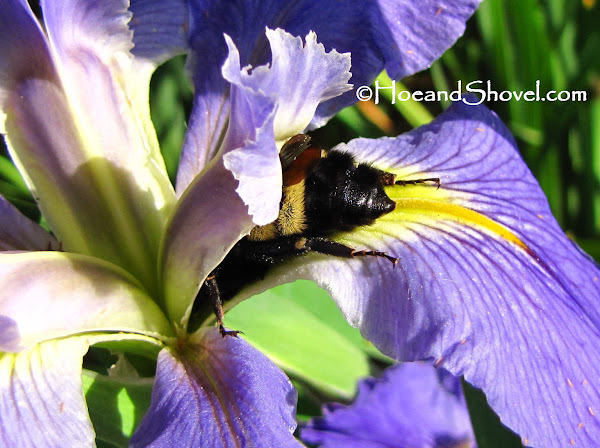 Walking Irises are fun....love the snuggled bumble. I always enjoy your posts and like the other commentors, I also have to say the pictures today were AmaZing! However, I have the bulbs....hmmm, but now I want a "Regina" what seductive photos you have posted, enough to make me pause with the paint brush and get in the dirt! Ooh...love all those views of 'Regina'! Isn't it lovely how the blue hues change in the light? I've noticed those varying shades of lavender and blue on mine...in all of the two weeks I've actually had blooms. I see those Louisiana Irises often in books, where they are recommend as the best iris for Florida, but I've yet to encounter one in a nursery. Perhaps I should try internet ordering again. 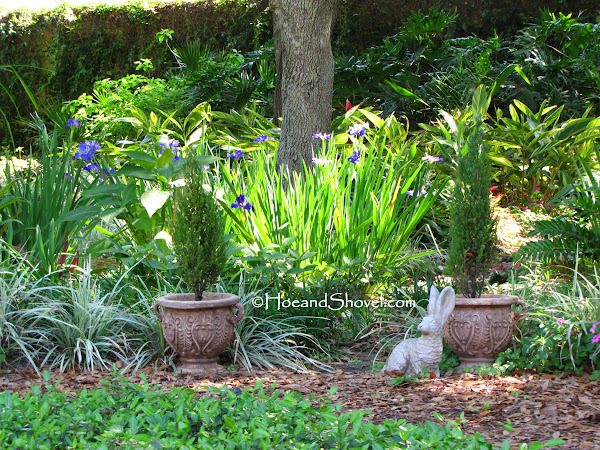 I must agree...Dietes is a superb Florida plant! 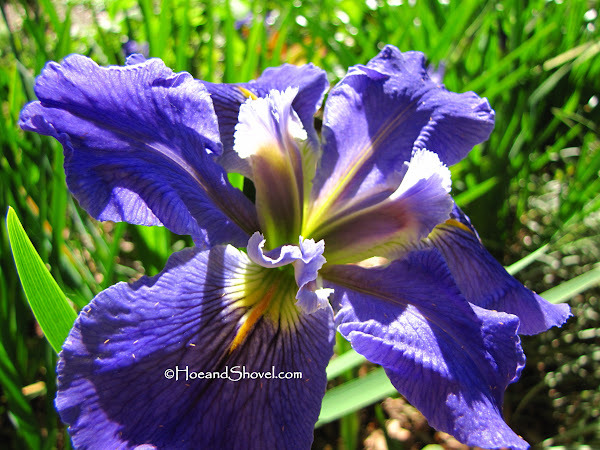 You really can't beat an iris that blooms all year! I really took it for granted in my younger years, considering it too easy and too common. My older (and wiser) garden-mind is learning to appreciate the stalwarts these days. 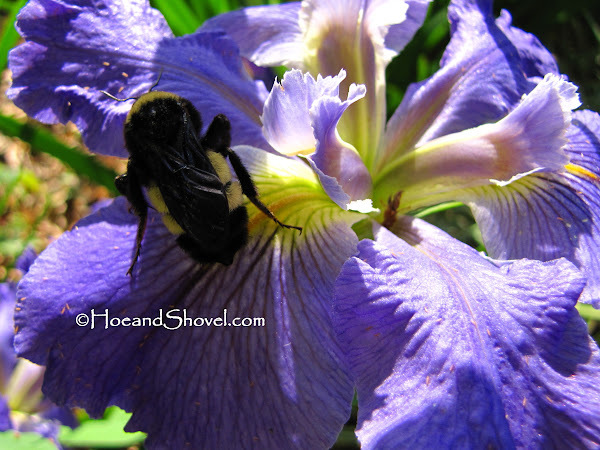 Love all your iris flowers. 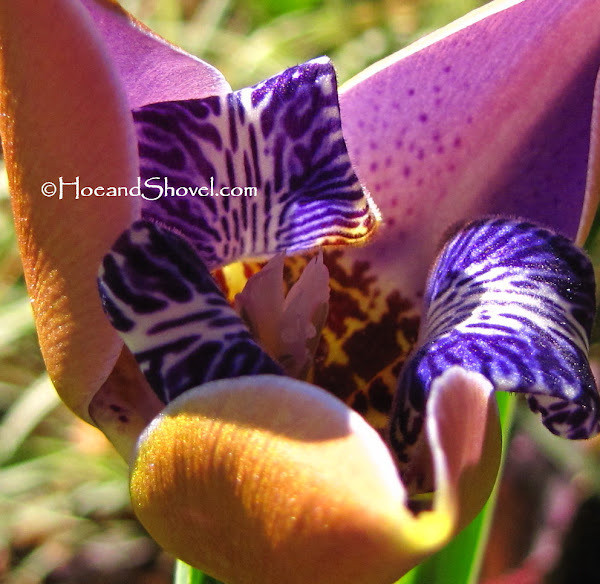 I have two of them, regina and Dietes iridioides. 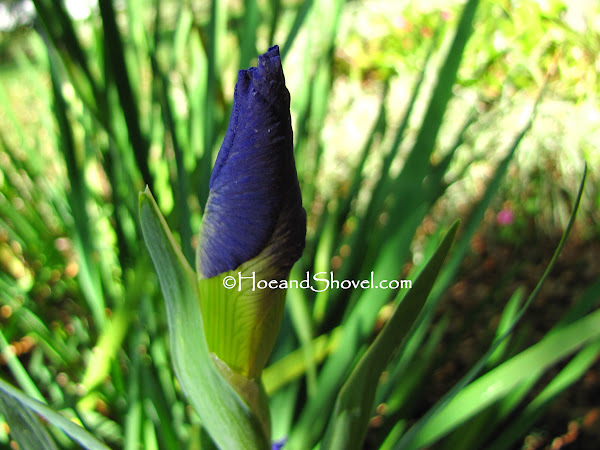 That Louisiana Iris 'Sinfonietta' has such deep blue, which is my favorite flower color. I have to see if I can find it, maybe I also can order it via internet. Your photos of different stages of Regina are so wonderful. I tried to do the same without sucess since I keep missing them. Such great beauty with such short flower period. 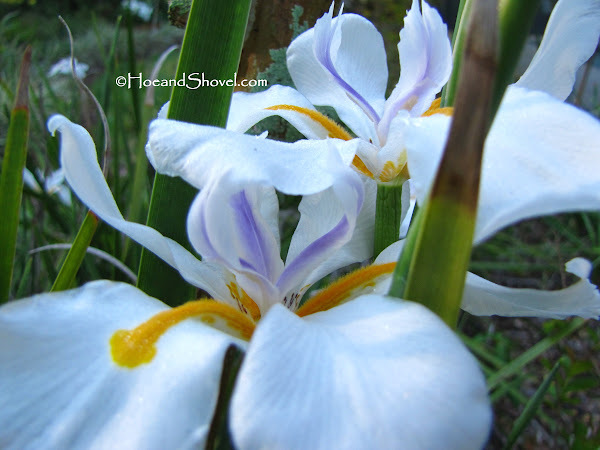 I also agree Dietes is a wonderful iris for florida garden. I have been enjoying its flowers in my front garden. Hi Meems...who needs bearded iris' when we've got all these beauties to pick from. You can't beat these unneedy plants which are so easy to take for granted until they bloom. Your Irises are just gorgeous. 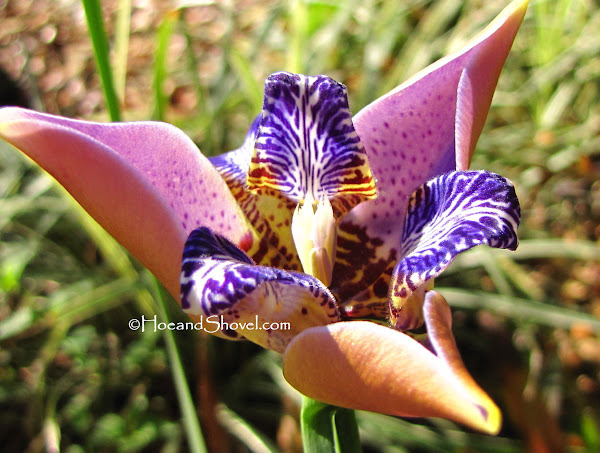 We have planned on planting some of the African Iris and also the Louisiana Iris. I hope they will do well here in SE Texas where I am living. Hi Meems. Oh girl your irises are just gorgeous. 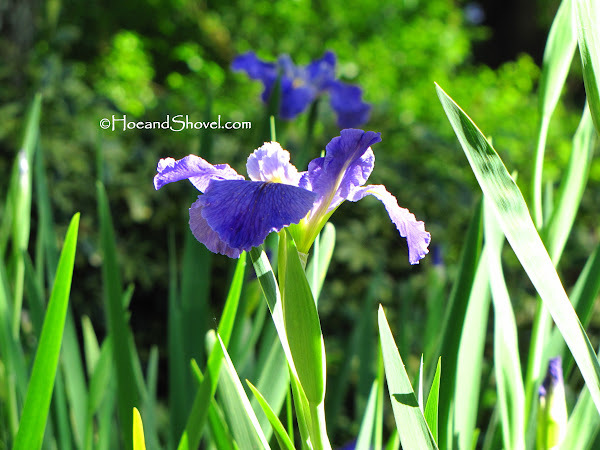 I went on an iris kick last fall and planted so many and now cannot wait to see them bloom. LOL! The white ones are my favorites of yours. They just look so delicate. What a joy! I just bought 2 x Sinfonietta last week but didn't actually know what they look like - I will be ecstatic if they look half as good as your photographs! Beautiful pix of Regina opening, Meems. A friend told me she actually watched a blossom open! Mine have been great plants, tolerant of full sun and freeze (they took a lot of leaf damage in December, but tossing the blossoms now.) 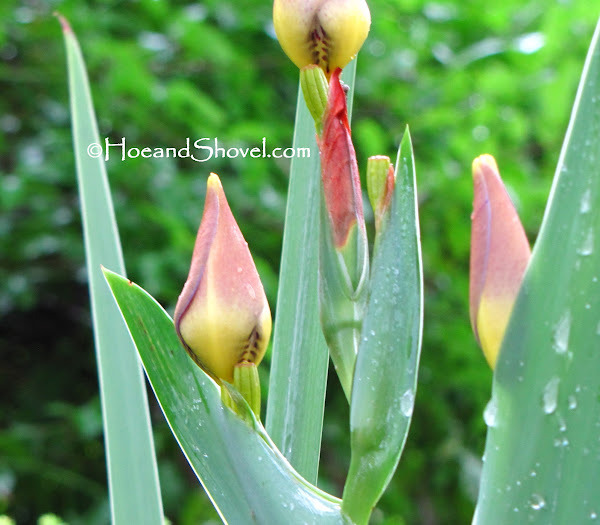 Everyone raves about African iris, and I do love the flower, but mine hasn't bloomed in years. I keep moving it in hopes of finding the right spot. Siberian iris is another great one for us, and the yellow walkers may be "common" but, like Floridagirl, I've learned to appreciate the tried and true. Your irises are so pretty and full of life. I just love to see the bee butts. I know it wont' be long and I will have my own little bb's around the garden. 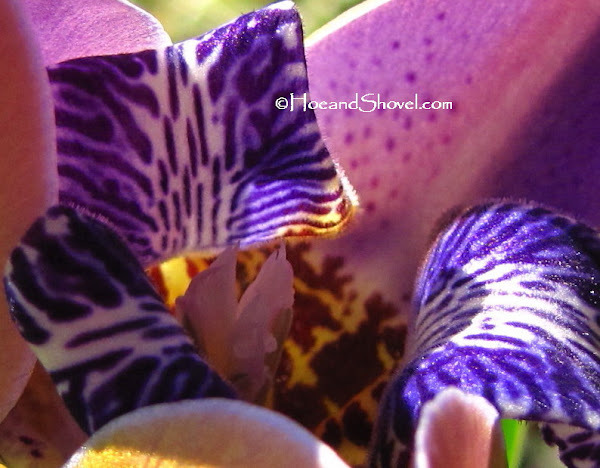 Love your irises, Meems, and your photography AND the way they multiply. I just planted some Reginas which makes your photos doubly exciting. Great post! some flowers are worth every little indulgence. what beauties...loved being able to see them blooming. it was almost as good as being there. i have some planted around the picket fence in the back but can't remember the name of them. i just got a new one that i put in a container...yellow. i really loved your photos...beautiful captures and lighting. 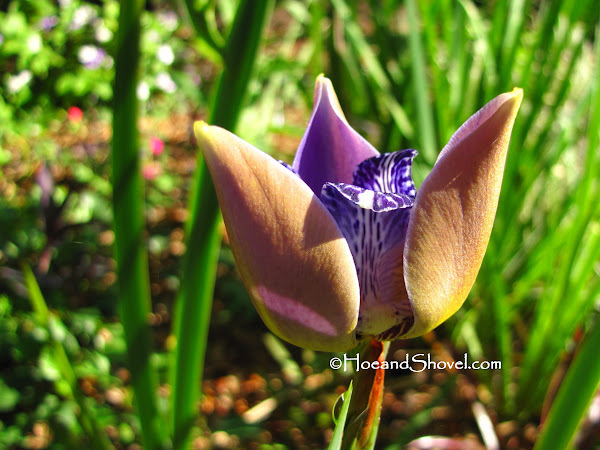 I need to plant some irises in my garden. I have a sort of special feeling about them. When we graduated high school our class was sort of the underdog, and our principal gave us all irises and commented that in some states they're classified as weeds--but it's all in the eye of the beholder and they're actually something really special if you take the time to look. 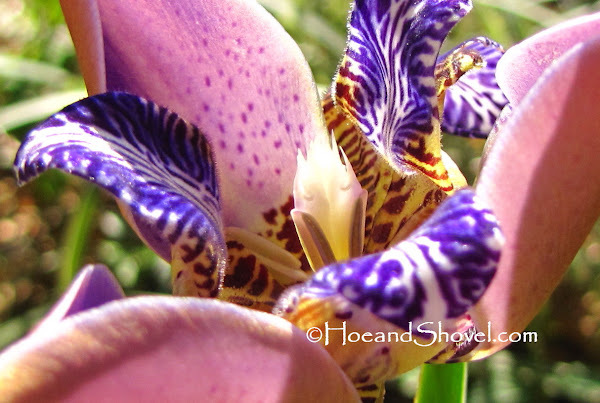 Those brilliant purple irises are stunning! Your Irises are really spectacular. It would be great if they would bloom for more than a week but they really put on a show when they do bloom. Thank you all for enjoying the irises with me. We had over 6 inches of rain Thursday in a 24 hour period and the Louisiana Irises really took a beating. There were high winds also. I cut a bouquet of the ones that were falling over so at least I got to relish them for a little longer. The buds not yet opened are openinging up each day. 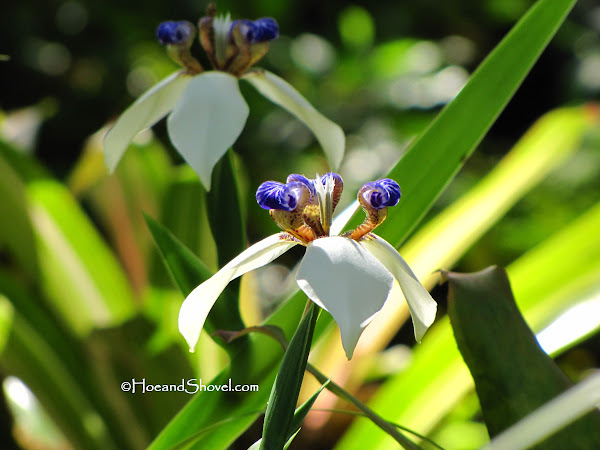 The African Irises on the other hand LOVED the rain and every plant burst out with gorgeous white blooms the very next day. I'm always amazed at how they do that. In the morning they are full with buds and by mid-day they are all open in happy glee for the sunshine.